And so the Atlanta Bylines Begin. I've been in Atlanta for a few months now focused on listening and learning. I've gone to workshops, panels and conferences and am actually in the middle of the Wharton School's Seminars for Business Journalists in Philadelphia. As I work to improve both my journalism and my understanding of the layered, fascinating city of Atlanta, I have slowly ramped up freelance assignments, too. I've included one here, my first in the Atlanta Business Chronicle. It's about a growing hospital network in West Georgia that's making some "nontraditional" investments in its community's health. While there isn't much of a clear short-term payout for these initiatives, Tanner Health has decided it's still a priority. Carroll County hopes to see long-term benefits from initiatives that take preventative health care outside of the walls of hospitals and doctors’ offices and into the community. The initiatives range from the completion of the Carrollton GreenBelt to Tanner Health System partnering with churches and schools to foster healthy lifestyles for the long-term. Improving community health is a good economic development strategy, said Tanner Health System President and CEO Loy Howard. “We think if we can actually distinguish ourselves as a community where health is important, that’s where future employers are going to want to land,” he said. Since 1949, the nonprofit health system has grown across west Georgia and east Alabama, now with over 300 physicians across four facilities. They have expansions underway in Villa Rica, Bremen, Carrollton’s Dixie Street and a new hospital opening soon in Wedowee, Ala.
Tanner has also been investing in its community’s health in innovative ways, Howard explained. Tanner’s leadership noted that the future of healthcare was in preventative medicine. It saw an opportunity to “complement” the health system’s mission and services with “some nontraditional things for the Southeast and smaller communities, centered around helping people learn how to be healthier,” Howard said. The network used to organize health fairs to reach the broader community, but it found they were ineffective. “Without programs or ways for people to get into something that’s proactive, there’s a good chance when we do that health fair again in a year, people haven’t addressed anything,” he said. That’s why the board created Tanner’s first community health division in 2011. After a $1.2 million grant from the Centers for Disease Control and Prevention, it created the “Get Healthy, Live Well” coalition. “This is about getting active, learning how to eat right, and getting that out to everyone, not just a patient that has insurance,” Howard said. The initiative now has more than 500 volunteers and 22 subcommittees and task forces working in Carroll, Haralson and Heard counties to improve nutrition, physical activity, chronic disease and tobacco use. Stephen Allen, lead pastor at Tabernacle Baptist Church, plans to expand his church’s involvement in “Get Healthy, Live Well.” Tabernacle has offered classes like diabetes management, weight loss and suicide prevention and it has joined other churches for “health challenges” and events through Tanner. “We’re trying to change the way our folks think about health, physically and even spiritually,” Allen explained. Tanner has also supported programs at City of Carrollton schools to train teachers and provide resources to incorporate gardening, healthy cooking and physical activity into the curricula. “It’s broader than just feeding healthy school meals. We’re really trying to take it to that next level,” Director of School Nutrition Linette Dodson said. She hopes their work will create a healthier generation of adults: “I don’t think my generation was prepared as well, so hopefully we’re doing a better job of preparing our students,” Dodson said. “It’s all very interrelated, and there are a lot of exciting things happening in west Georgia right now,” Taylor said. 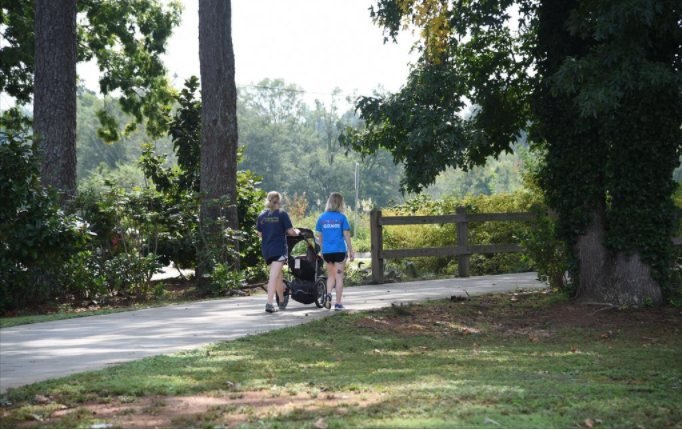 The same year Tanner created its community health division, Laura Richards founded Friends of the Carrollton GreenBelt to make the city’s long-lasting dream of a multiuse trail a reality. The 18-mile loop opened last spring. Richards, who also serves on the Carroll County Department of Health board, said she, too, had been concerned about her community’s health. She has watched Carroll County rise in the Robert Wood Johnson Foundation’s health rankings of Georgia counties. “Specifically, the 2016-2017 jump was the largest from 58th to 49th, so that shows there have been changes in the right direction,” she said, noting the ranking includes access to exercise opportunities. “Before the GreenBelt you could just walk on your subdivision streets and dodge traffic,” said David Mecklin, a partner at Tisinger Vance who credits the trail for encouraging him to walk. The exercise actually triggered a need for a stress test that detected a blocked artery. She cited the new bike share program as one such successful partnership between Tanner Health, manufacturer Southwire and the University of West Georgia. Today, Tanner is working with the city to extend a spur off the GreenBelt into downtown. A healthier population is expected to benefit the community, including improving economic development. But it won’t come quickly.